The changes in the recent versions have mostly been details. In the next release, Easy2Sync will contain some bigger changes. One is the new request dialog which will display the facts clearer. The new version isn’t available online yet, but if want to synchronize your files, please try the current version. The new version has an improved sync overview dialog and password support for Exchange servers. 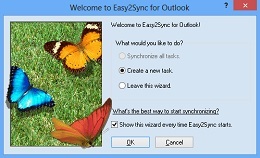 Download our Outlook Sync program! Did I catch you? Great, here are a few things you should consider when choosing the right boilerplate software for you. These are absolutely essential if you want to stay organized. If you plan to use boilerplate only in your e-mails you might want to look for a product that can be integrated into your mail client, making the texts easier to access. If you want to use it in other places, too (software development perhaps? ), you should use a program than can cooperate with all applications on your PC. If you speak more than one language and answer support mails in the other language(s) you’ll find it useful to have your boilerplate text in multiple languages. If your company is not a one-man-show, you’ll probably want to share your canned text with other persons. You could probably just copy the configuration files around, but it would be easier if the program supports a multi-user environment from the start. You’ll probably look down on this point. But I’ve found it very useful because it’s easier to memorize an image than a text. Good luck with your boilerplate! Thomas Holz is the owner of www.itsth.com, a company offering the “Easy2Sync” file- and Outlook synchronization tools as well as the boilerplate software for Outlook “ReplyButler“. It can find duplicates that are not in the same folders. That’s all. Have try, Download 1-Click Duplicate Delete for Outlook. If the boilerplates really become useful for you and your collection grows, you’ll face a different problem. Finding a text you’ve written months ago. That’s why you have to organize and maintain your texts. Giving the texts short headlines is essential and folders are very handy, too. The English language isn t very picky when it comes to addressing a person, but other languages offer more choices than simply “you”. Depending on your language and communication policies you may even want to store the same text in different styles: formal and informal. Otherwise you might easily end up with addressing somebody with his last name in the greeting phrase and using an informal addressing (“tu” in Spanish, for example) in the boilerplate. Sometimes texts are basically the same for several products or vary in other minor issues. So it makes sense to use one single boilerplate here and just fill in the gap when you re inserting the text. Some boilerplate programs can ask for the gap text. If yours doesn t, simply use a placeholder like ######. The hash marks are great because you can very easily see them and it s less likely that you send out a mail where you didn t fill in the gap. Our Company Logo Designer already has a lot of templates (the Comfort Edition a whopping 250), but here are some more. This week, we can offer you free, elegant logo templates. You can get this free logo pack “Elegant logos” here. They have many names. The dictionary calls them boilerplate text, but you ll also find them as stationery, AutoText, templates, canned text or text macros. The idea is always the same: Type a text once-use it many times. This article is about why they are useful for software support and how to get the most out of them. Customers are asking questions. And chances are that they’ll ask you the same questions over and over again (probably ignoring any FAQ). And you’re typing the same answers again and again. You don’t? Sure? Test it! For the next twenty answered mails, pause for a second and think if you didn’t write that answer (complete or in parts) before. You’ll see that it happens more often than you thought. Still, you probably refrain from storing these texts in some form, because of the extra work this causes. Organizing the texts, choosing a wording that can easily be reused later for another customer, etc. But this work quickly pays off; you just have to start it. And the more boilerplate replies you have ready, the more time you can save, you’ll see. As a side-effect, you ll probably also deliver the answers to customers quicker than you used to. Since canned text makes answering e-mail easier, you re less likely to procrastinate the answers. Boilerplate has another advantage. Customers sometimes are unfriendly or simply write stupid things. It’s tempting to let your feeling go wild and write a hefty response. That may be satisfying for the moment, but it will definitely backfire. Trust me, I already made that mistake. If you have a boilerplate response to handle the customer’s issue (written in a friendly tone) it’s much easier to give the customer a professional reply. Furthermore, a boilerplate library makes it easier for other persons to do your support work. Either while you’re on holiday or if you permanently give the support job to somebody else. This way they have to know less about your products and your company policies because they can just use pre-written texts. Creating and using your boilerplate forces you to organize and categorize your support cases. This will also make it easier for you to see what the typical questions are that the people keep asking. That s very valuable knowledge. Perhaps you can change your product or website to make these issues clearer even before the customer has to write you an e-mail? Designing logos with the Company Logo Designer software is easy, but even it is even easier if you have a nice logo template to start with. They’re free, they don’t even require the paid version. Download the Company Logo templates.